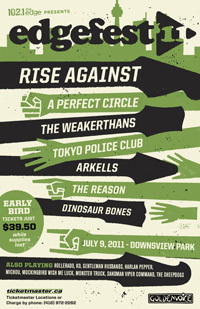 One of the biggest Toronto music festivals, EDGEFEST, has announced itsline-up; It includes Rise Against, A Perfect Circle, The Weakerthans, Tokyo Police Club, Arkells, The Reason, and more!!! The Edge is offering a special early bird price is $39.50 if you purchase it between Wednesday, January 26th at 10:00am- Friday, January 28th at 10:00p.m. (Click here to get the Pre-sale password!) You can still get the same pricing on the general sales from this Saturday, January 29th at 12:00p.m (while supplies last) Don't miss out this great opportunity to get your ticket! Hey Jess, it is on July 9th! !